The clean lines, mid-century modern aesthetic, and calming white and pastel accents are perfect for the desert setting. Sagewater Spa is imbued with simple elegance. The serene retreat only has seven guest rooms, but every one of them has marvelous mountain views. YOU SHOULD KNOW This is a mostly phone-free environment. No phones or headphones are allowed in the pool or shared areas. All rooms host kitchens, stocked with homemade coffee cake and organic, fair trade coffee. The FRETTE bed linens and towels are shipped in from Italy, as are the indulgent feeling robes. Though this is the perfect place to take a digital diet, Wi-Fi is free in the rooms. Sagewater Spa is the rare boutique hotel stocking Aveda bath products. Guests will ring a doorbell to be whisked into the quiet property and lead to their sanctuary, er, room. Guests are allowed to use the pool and hot tub 24-hours a day. There are 16 known minerals in the natural spring water that populates the pool. Though the mineral water comes from the ground at 165°, Sagewater Spa cools it to 105° in the spa and 90° in the swimming pool. There are 13 in-room massage options to choose from, plus skin care, body wrap, and Watsu®, a Shiatsu massage in the pool. There’s no on-site restaurant, but rooms have full kitchens and the hotel owners provide fresh baked bread using a family recipe. A car is recommended, especially to run to the grocery store and stock the fridge. Plus, all nearby oasis, desert, and canyon hiking can only be accessed with a drive to the respective trailhead. Head to Windmill Market (11-minute drive) for date shakes you can enjoy in the cute little courtyard in the back of the small market, deli, and produce stand. You might be nervous to try sushi in the desert, but Sushi Domo (4-minute drive) hosts an expansive menu with all kinds of rolls and izakaya options, like gyoza. Casa Blanca (4-minute drive) serves Mexican food with all the standard items, but go for the extensive and unique seafood items. Head over to downtown Palm Springs (20-minute drive) for a buzzy bar scene. But our recommendation? Pick up some wine at Stater Bros. (4-minute drive) and enjoy a quiet night in. There's no better place for a digital diet than a hot springs hotel in the desert. 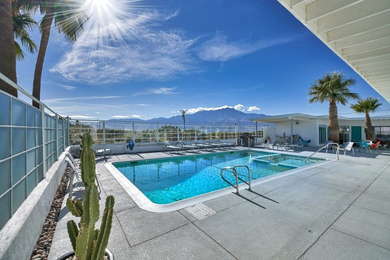 Sagewater Spa is close to amenities, like groceries and gas, and just a hop over the 10 to Palm Springs if you're feeling more festive. Booking a stay here is the perfect combination of feeling like you're getting off the grid but really not having to go that far.